May Wedding Photo Challenge; You have been Tagged! Getting excited for the first Photo Challenge EWAM (now Knotsvilla) is organizing. 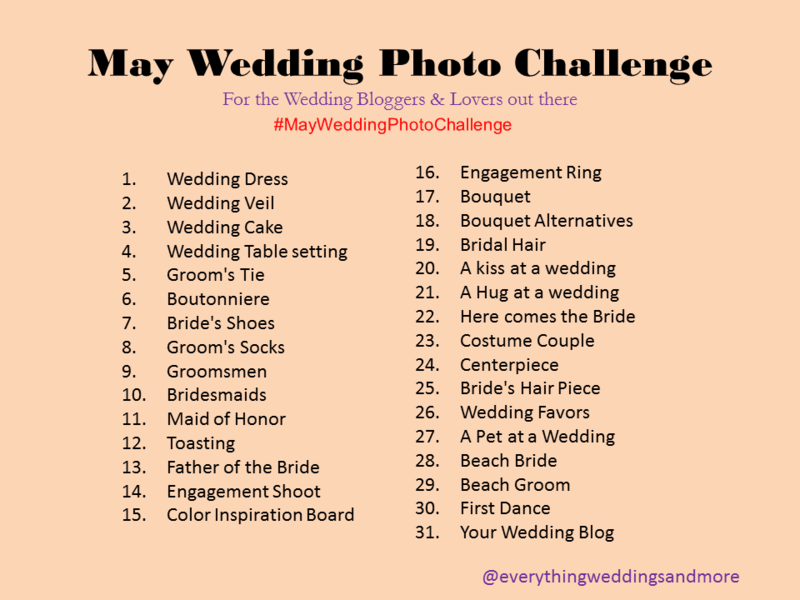 As it says in the picture, it is for the May Wedding Photo Challenge for Wedding Bloggers and Lovers. Major platform to follow would be Instagram but for those that don’t do IG, your Blog, Facebook, Google+ or Pinterest would be just fine. As long as we are providing loads and loads of Inspiration in the month of may for brides. There is a high chance I’d be sharing mine on all platforms anyway! So get excited for May; a month full of Inspiration. AislePerfect | AisleReady | Austin Wedding Blog | Burnett’s Boards | Bridal Musings | ChicBrownBride | NaturalHairBride | Wedding Talk | Beyond The Aisle | Efeford blog | Wed me Pretty | Kakie Wedding | I did tell you… | Classic bride | High Heels & High Notes | Holy Bride Blog | InspirdbyThis | CreativePurposes | Weddings By Paris | New Generation Bride | Intimate Weddings | Ruffledblog | Snippet & Ink | Green Wedding Shoes | 100 LayerCake | Em for Marvelous | WeddingLovely Blog | Limn & Lovely | The Knotty Bride | Wedding Party. Such a great idea Gee!! I’m excited you are all in and from what it seems ahead of me also! Hahaha! Thank you for this, Gee. I’m one of the bloggers on WedMePretty…we each have a board on Pinterest and are going to post according to our specialties (I’m DIY and Budget Savings). What fun!